Soak ful for 8 hours. Pressure cook it for 7-8 whistles in 4 glass of water. Drain water and keep it aside. Don’t throw away water. Smash garlic slightly with a knife and roughly chop it. Take a bowl. Add ful and crush it slightly with a spoon. Add onions, garlic, salt, cumin powder, black pepper, paprika, lemon juice and mix it well. If it is too thick add some of the reserved water. Garnish it with cucumber, tomatoes, parsley and serve it with any breads. Usually it is served with pita bread. 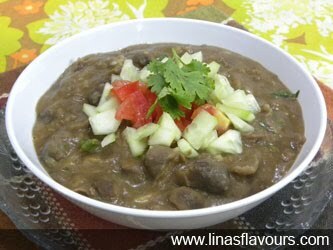 This is an Egyptian popular dish and it is also well known in Sudan. This is the traditional way of cooking. To make it more spicy you can cook it in this way also. Take a pan and heat oil. Add onions, garlic and saute it till it becomes translucent. Add salt, black pepper, cumin powder, paprika and cook it for 2-3 minutes. Add tomatoes and cook it for a minute. Add ful and cook it for about 5-7 minutes. Add about 1 cup of ful water (which is reserved) and cook it for about 2-3 minutes on a medium flame. Garnish it will cucumber and parsley and serve it with any bread.